Everyone in San Francisco is required to keep their recyclables, compostables, and trash separate. Materials in your blue bin are made into new bottles, cans, and other products. Food, soiled-paper and plants in your green bin are composted into nutrient-rich soil used by local farms. Find out about recycling and composting requirements for SF residents, businesses, and event organizers. What is San Francisco’s mandatory Recycling and Composting Ordinance? How do I meet the requirements of the San Francisco’s Mandatory Recycling and Composting Ordinance? Do I have to pay extra for recycling or composting service? Will I get fined if my tenants do not recycle or compost properly? Will composting be messy or smelly? What if I don’t have much compost – can I put my kitchen pail on the curb for collection? How do I get recycling and composting service at my building? If I cannot physically move the blue, green, and black bins, how can I get support moving the bins to the curb on collection day? Where can I learn more about the Mandatory Recycling and Composting Ordinance? San Francisco’s Mandatory Recycling and Composting Ordinance requires San Francisco residents and businesses to properly separate recyclables and compostables and keep them out of the landfill. Learn more about San Francisco's Mandatory Recycling and Composting Ordinance (PDF). Contact Recology at (415) 330-1300 to order service and receive recycling, composting, and landfill bins. 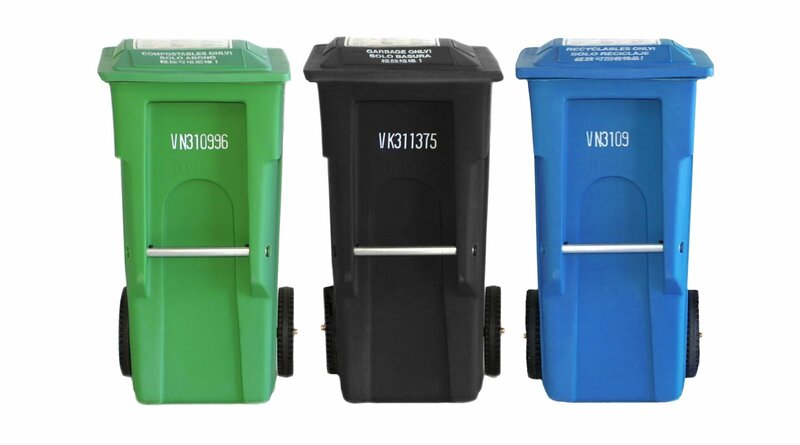 Property owners and managers must provide color-coded containers for tenants, employees, contractors, and customers to ensure separation of discards. Residents can choose to compost at home and take recyclables to appropriate recycling centers. Participate by putting recyclables in the blue bin and compostables in the green bin. Find reuse, recycling, and safe disposal options for everything from electronics to couches. San Francisco residents receive recycling and composting service with landfill service at a flat rate. Apartment buildings (6 units or more) and businesses pay a reduced rate for recycling and composting service. When residents and businesses recycle and compost everything correctly, they can reduce landfill service and save money. Residents can reduce their landfill service from a standard 32-gallon bin to a 20-gallon bin. Businesses can save up to 75% off the variable costs of the refuse bill by reducing the size of their landfill bin or frequency of pick-up. Building owners will be fined if they fail to provide tenants with adequate blue, green, and black bin service and information on their proper use. Collecting compostables should not be any more messy or smelly than putting food scraps in your trash. The same materials are being collected – just in a different container. Compost must be placed in Recology’s curbside green bin for efficient curbside collection. Renters can call their property managers and inform them about the Mandatory Recycling and Composting Ordinance. Has your property owner or manager declined to provide recycling and composting services? Fill out a request to have SF Environment's Zero Waste team follow up with your landlord or propery manager. RecycleWhere? - Find out where to reuse or recycle items according to the highest and best use.